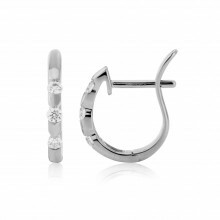 A traditional looking diamond set "huggie" style hoop earring. The earrings are 18ct white gold set with eleven round brilliant diamonds in each earring, with a total carat weight of 0.15ct. The simple hinged design is made to "hug" the ear and lends themselves to be comfortable to wear as an everyday style perfect for either day or night.